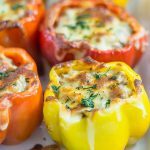 These colorful Keto Stuffed Peppers and filled with delicious our Low Carb Cajun Ground Beef and topped with melty cheese. It’s a quick and tasty meal that’s easy on the budget. Preheat your oven to 200C/390F.Place a large saucepan over high heat and add the oil, onion, and garlic. Saute until the onion starts to turn translucent. Add the ground beef and saute until browned, then add the salt, pepper, and tomato passata. Mix well. Lower the heat and simmer the mixture for 5 minutes. Remove the pan from the heat, stir through the cauliflower rice and set aside. Prepare the peppers by slicing off the tops and removing the seeds and white pith from the inside. Sit them in a baking dish with the cut sides facing up. Evenly spoons the ground beef mixture between the peppers and top with cheddar cheese. Bake in the oven for 15-20 minutes until the cheese has browned and the peppers are soft.